This post is part of my story on our first Europe Trip to Holland and Belgium. 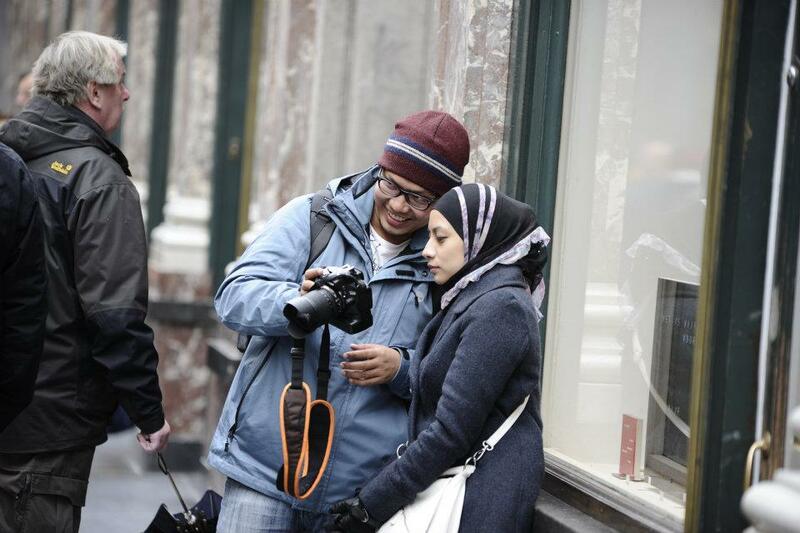 Me and HUbby .. Brussels City! We had to put on our jackets, sweaters..
as the outside temperature was about 6-8 degree celcius. 1st picture with Mr Teoh, at the arrival hall, Schiphol Airport. After freshened up, and we're ready with our jackets! Mr hubby..sempat posing before naik bas. From Amsterdam, we headed to Brussels by bus. First pit stop, the RNR..
our short journey to Brussels.. Finally arrived at the Atomium! "Unmistakable symbol of Brussels and Belgium and unique feat in the history of architecture: the Atomium is today the most popular attraction in the Capital of Europe. At night, 2970 lights offer a fairy dimension to the 102m high building." Moving forward together.. and together we're going to achieve MORE! Done with Atomium, we were so hungry already..
We had our lunch at Brussels city! The chicken with rice and giant fries! with the one and only mentor, Hanis Haizi! Later in the evening, we checked in to THON HOTEL, Brussels City Center. Night view of Brussels City from our room! and will definitely looking forward to visit the city again! Join my Beautiful Circles now..